Review posted July 28, 2014. Millbrook Press, Minneapolis, 2014. 33 pages. This beautifully photographed book tells the true story of an unusual farm – El Bosque Nuevo, in Costa Rica, where they grow butterfly pupae. This story begins with a museum in Boston receiving a box full of butterfly pupae which are about to become butterflies. Then it zooms to Costa Rica and shows us the screened greenhouses where the butterfly farmers keep the butterflies. The book shows all the parts of the process, including feeding the butterflies with crushed bananas and sugar water, searching the leaves for predators, making sure the growing caterpillars get plenty to eat, and gathering the ones almost ready to become pupae. They explain the stages of an insect’s life. The blue morpho caterpillar grown at El Bosque Nuevo changes its patterns dramatically at each stage of molting. The pictures show workers sorting hundreds of pupae to send out, shows how they are kept in the museum, and finally shows the wonder of a little girl looking at a newly-emerged butterfly. For those who want to know more, the back matter is most interesting. 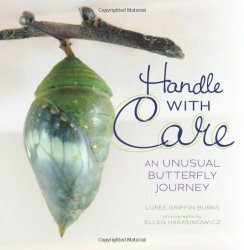 This is a nice twist on a simple book about butterflies – shows an actual butterfly farm and the entire process of growing a butterfly.